AI-driven mobility solutions and electrification is certainly the future of tomorrow. Attributing technological advancements as the key player in development, Bosch Group discerns strong signs of recovery in the Indian market and forecasts a positive development over the mid-terms. While in 2017, the leading IoT and Services Company graphed robust double-digit growth with sales of 2.2 billion euros (15.4 percent hike). Bosch in India expects to continue with the same momentum with a projected 7.7 percent GDP-growth in 2018 and a similar level for the coming years. On his visit to India, Dr. Volkmar Denner (chairman of the board of management, Bosch Group) announces, “The Indian economy is on the rise again and holds tremendous potential. To meet the rising demand in the Indian market with tailored solutions and expand India’s strong role in our global network, we will invest Rs.17 billion over the next three years”. A major share of this, Rs.600 crores, will be used to expand Bosch’s smart campus in Adugodi and modernize manufacturing facilities in the country. With India leap-frogging from BSIV to BSVI, Bosch India in collaboration with OEMs is geared up to achieve BS VI implementation from April 2020. Hence, Bosch Group is aggressively endeavoring on innovation and R&D to offer right technology for both the initiatives and believes that ICE (Internal Combustion Engine) will continue to be mainstream solution for freight and commercial vehicles while its electrification initiative will address transformations in urban mobility. Concerning combustion engines, the key to making them more eco-friendly lies in synthetic or carbon-neutral, fuels, whose manufacturing process captures CO2. In this way, this greenhouse gas becomes a raw material, from which gasoline, diesel, and substitute natural gas can be produced with the help of electricity from renewable sources. According to new European RDE standards, on an average, test vehicles equipped with enhanced technology already emit no more than 13 milligrams of NOx per kilometer during road tests. Ultimately, Bosch views co-existence of fossil fuels and electrification with hybridization as an interim solution on road for an electric-future. Meanwhile, hybrid technology will be beneficial for electrification in India, particularly viewing the prevalence of stop-start driving due to traffic congestion. 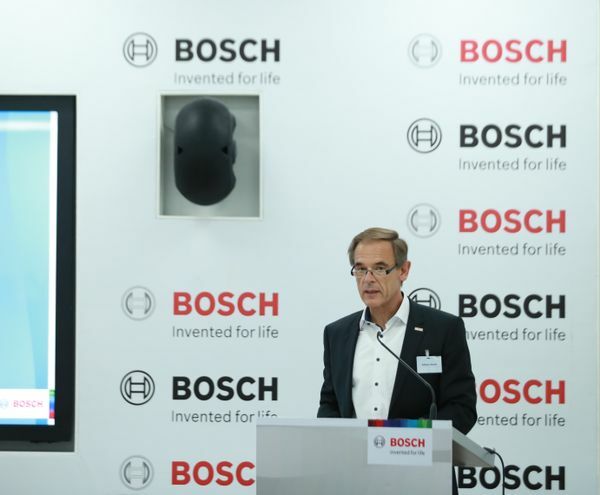 Addressing the improvement in quality of life and contributing to eco-and climate-friendliness as Bosch’s top agenda, Dr. Volkmar adds, “‘Invented for life’ ethos is our motivation for developing the best possible technologies for environmental protection. We want to help keep people mobile, while improving air quality. There’s a future for diesel. It will remain integral to tomorrow’s mobility solutions”. Indian automotive industry is witnessing demand leap for connected mobility. Adducing this huge demand in-place, Bosch established a Connected Mobility Solutions division to develop, sell digital mobility services and fulfill its vision of emissions-free, stress-free, and accident-free mobility. The new division works for developing a global telematics platform, enabled and operated by local engineering talent. This platform offers end-to-end solutions, including connectivity control unit, integration of mobile network operators, development and operation of cloud-based services, smartphone app development and support for back-end solutions. The key offering includes vehicle sharing, ridesharing and connectivity-based services for car drivers. Dr. Volkmar asserts, “Bosch India serves a global customer base through the telematics platform. It’s a good example of how we are harnessing local expertise to offer cutting-edge innovations for the global market, an approach we call – local for global”. With solutions for factories and cities of future, Bosch is supporting the government’s ‘Make in India’ and ‘Smart Cities’ initiatives by making factories automated, connected and agile for better customer experience. Around 18,000 out of Bosch’s 31,000 associates in India work in research and development (R&D) while the added new teams drive forward solution development for IoT which are especially tailored for local needs. Bosch has also partnered with CII (Confederation of Indian Industry) 4.0 Council to create ‘Smart Advanced Manufacturing and Rapid Transformation Hub’ national action plan. This involves government support for SMEs and industrial bodies with smart manufacturing policies. India also plays a significant role when it comes to Artificial Intelligence (AI). “Most of the products in near future will be linked to artificial intelligence. These products will either possess that intelligence themselves or AI will play a key role in their development or manufacture,” said Dr. Volkmar. In 2017, the company invested 300 million euros to establish Bosch Center for Artificial intelligence (BCAI) across three continents – Bengaluru (India), Sunnyvale (U.S) & Renningen (Germany) while the fourth location is planned for China. Additionally, Bosch has set up Robert Bosch Centre for Data Science and Artificial Intelligence at IIT-Madras with an annual funding of Rs.4 crores for the next five years. This center will set a precedent in the way big data is used to improve problem-solving capabilities in the industrial domain. At the same time, the results of the collaboration will also deliver benefits for society at large. By combining IoT eco-system with AI, Bosch is all geared up to create unique value propositions in this domain. According to the latest global data, India has overtaken Germany to become the fourth largest automotive market in the world. Besides, automobile sales in Asia’s third largest economy, India, including passenger and commercial vehicles, grew by 9.5 percent last year. With this profitable success on-board, the company continues to offer promising business opportunities, broad product range and beneficial solutions to improve the quality of people’s lives and shape the connected world, both in India and beyond. Hence, a story that started in 1922 continues its path towards success by integrating of technology and talent.